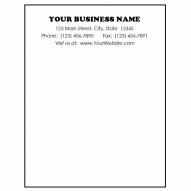 This Set of 12 Custom Business Note Pads is a great way to spread the word about your business! Each pad is 4.25" wide x 5.5" high with 40 sheets to a pad and all have a chipboard backing. This sampler set is a great way to preview the quality of our printing services without incurring the higher expense of having hundreds or thousands printed first. Ordering is easy ... simply purchase this item and we will contact you for your notepad information. You will send us up to 4 lines of text and we'll do the setup work for free! If you have letterhead, we can replicate the font to match. Each proof will need to have your acceptance of the proof before we will print these for padding. Turnaround time is approximately 2 weeks from acceptance of proof. Normally, these will be in the mail to you within 1 week. Items will ship via USPS Priority Mail with Tracking.